Simply put aperture cards are card blanks with die cut windows; they are really useful for designing eye-catching framed cards and for also adding depth to your projects. 1. With a piece of the Dovecraft Bohemian paper, cut a 14.5cm square and stick to the card front. To make an aperture for the front, use the third largest nesting die and cut. 2. With your chosen Bohemian paper, cut a piece of 15.2cm square to cover the inside of the card. We have used the damask paper with floral border. 3. To create the inside concertina fold, cut a piece of card 15.2cm by 10cm. Score and fold 2.5cm in from both sides to create three panels. Turn your card so the opening is on your work surface and stick one of the 2.5cm to the inside of the card front and the other 2.5cm behind the card. 4. Stamp 2 butterflies onto some patterned paper and stick to the inside so it is at the centre of the aperture feature. 5. To decorate the card, we have surrounded the aperture with paper blossoms. To make two paper butterflies, we have used a contrasting Dovecraft Bohemian paper and cut using the Fiskars Squeeze Butterfly Punch. Stick to the card and finish the border by adding an adhesive gem or pearl to the flowers and butterflies. 6. Stamp the ‘Love & Wishes’ sentiment and cut to shape with a fishtail edge. Add several 3D foam pads to the back of the card in the centre to give a curved appearance and stick to the top of the card at an angle. 7. 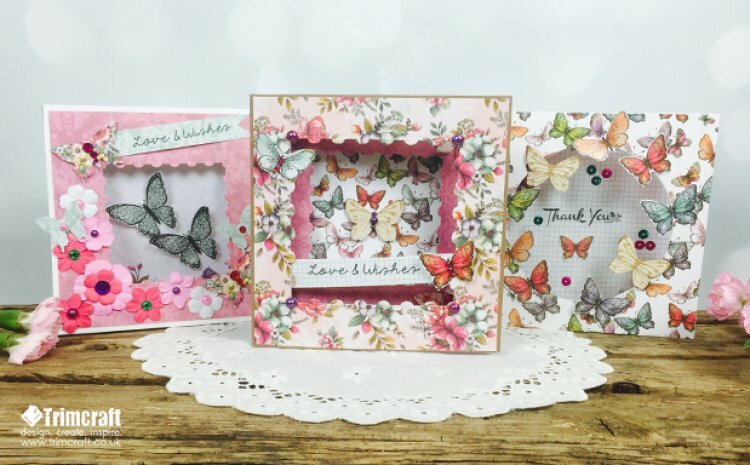 To finish, we have added a Dovecraft Bohemian Printed Butterfly to the corner of the stamped sentiment and to the bottom right corner of the aperture and embellished with three gems. 1. With your chosen piece of Dovecraft Bohemian paper, cut a 15.2cm square, cut the aperture out, by using the window as a template, before sticking to the front of your card. 2. Cut a 15.2cm square with the acetate and stick to the inside of the aperture. With a contrasting piece of paper, create a 15.2cm square and cut out the aperture. Stick the paper over the acetate using double sided tape. Make sure the edges of the acetate are covered.Using the Dovecraft Bohemian check paper, cut a 15.2cm square and stick to the inside of the card. Stamp the ‘Thank You’ sentiment in the centre. TIP: If you are not confident stamping directly onto the card, stamp on the same pattern paper and cut out before sticking down. 3. We have embellished the inside of the card with some butterflies cut from the front of the 6" x 6" paper pad, then cut the bottom section of the front cover to size before gluing into place. 4. For the front, we have cut seven butterflies from the 12" x 12" paper pack and stuck them around the aperture. To finish, add some sequins and 2 wooden butterflies to the front of the acetate. 1. With two different Dovecraft Bohemian papers, cut a 15cm square and cover the front of both cards. 2. Using the second largest nesting stamp, die cut the stamp on one of your card fronts. Use the third largest die for your second card front. Stick both cards together by stick both the backs together using double sided tape. 3. Cover the inside of the card using a contrasting patterned paper. We have used the pretty multiple butterfly paper for ours. 4. Print the ‘Love & Wishes’ sentiment stamp onto a strip of patterned backing paper. Once dry, cut to size and stick to the back of the front aperture at an angle. To decorate the front of the card, we have then added two butterflies from the front of Dovecraft Bohemian paper pad and embellished with three gems. We have then added four large adhesive pearls to each corner of the nesting stamp. 5. For the second fold of the card, we have added two printed butterflies to the inner aperture and embellished with 3 gems in different sizes to create the butterfly body. 6. To finish, we have added a wooden butterfly shape to the centre of the card and decorated with some pearls to coordinate with the pearls used on the front of the card. Are you tempted to make your own card with apertures? We would love to see what you make, simply share it on the project gallery!